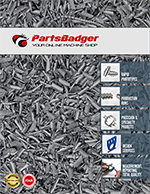 PartsBadger is YOUR Online CNC Machine Shop. We believe ordering custom parts ought to be simple, fast, and straightforward. When we designed and created our Instant Quote system, we began with the goal of making prices available right away. We know that getting a price on your part without having to wait allows you to move faster, which means your ideas move forward. PartsBadger was founded by a couple of guys who needed custom parts machined. The process turned out to be time consuming, overly complicated, and expensive – so expensive that purchasing a CNC machine proved to be the better option. Really. It started when we designed an aluminum enclosure for our video recorder business and started looking for someone to make it. We thought it would be easy. We sent off twelve RFQ’s and had a total of three responses – weeks later and at ridiculously high prices. So we bought a CNC machine and learned how to use it – because that was literally the only way we could get things done at a reasonable cost and fast enough to meet our needs. Soon enough, we outgrew our Trusty Tormach PCNC770 and started to expand to meet our own needs. It dawned on us that everyone else who has ever wanted a custom part machined likely had encountered the same roadblocks and we knew we could help. The process for ordering custom parts was outdated and unreliable. Using modern tools, we created a way to get instant quotes, great prices, and reliable performance. See for yourself how our online machine shop works– get an instant quote now. Roy Dietsch has spent the last decade developing aerospace technologies using innovative manufacturing methods. Roy received his M.B.A. from Concordia University and has a B.A. in Economics with a focus in Mathematical Sciences from the University of Wisconsin-Milwaukee and studied Computer Sciences and Information Systems at the University of California-Berkeley. Roy is executing the vision of changing the way people buy custom parts with a fast, easy, and customer focused process. With nearly a decade of experience in automotive and aerospace manufacturing, Jimmy knows the importance of quality. As former professional race car driver and two time SCCA National Champion, he also knows how to get things done fast. Jimmy has a degree in Business from the University of Phoenix and also studied at the University of Wisconsin-Whitewater and University of Pennsylvania Wharton School. Jimmy makes sure you get high quality parts fast. With an extensive background in robotics, manufacturing, and project management, Steve offered the experience to help get PartsBadger where it is today. Although no longer active in the business Steve will always be an important part of the PartsBadger story.